Simplify your life with one of my fab retro theme metal wallets. 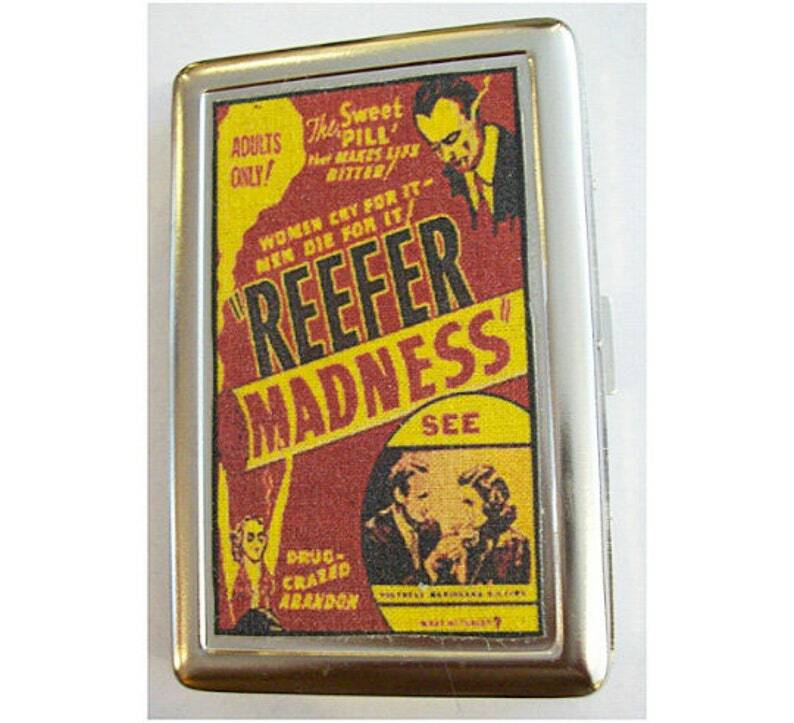 This example proudly features an image taken from the golden age of marijuana movie exploitation posters, either Reefer Madness or Devil's Harvest. Pop propaganda is a very unique slice of kitsch. These gems can hold cash, ID/Credit cards, biz cards and even cigarettes! This item page is for one case/wallet only so here's the hard part; you will need to decide which of these images you would prefer on your case and write me a note doing checkout saying "reefer madness" or "devil's harvest" . If no note is written I will assume that you want the one in the main/first photo. I make my cases by transferring the image onto lightweight canvas. I treat this with a coat of scotch guard and then adhere it to a brand new stainless steel case. I can make these cases with just about all of the images used on my other products so if you dig robots, pin up girls, old firecracker labels, Mexican wrestlers and the like then you should come on by! fantastic item shipped fast, thank you! These were such a big hit. My daughter loved these! Great artwork!